The critically acclaimed laboratory standard for more than forty years, Methods in Enzymology is one of the most highly respected publications in the field of biochemistry. Since 1955, each volume has been eagerly awaited, frequently consulted, and praised by researchers and reviewers alike. Now with more than 300 volumes (all of them still in print), the series contains much material still relevant today-truly an essential publication for researchers in all fields of life sciences. 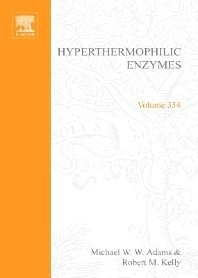 This volume and its companions (Volumes 330 and 331) cover all current knowledge concerning hyperthermophilic enzymes. Major topics in this volume include redox and thiol-dependent proteins, nucleic acid modifying enzymes, and protein stability from biochemical and biophysical standpoints. Researchers and graduate students in biochemistry, molecular biology, biophysics, microbiology, and cell biology. Academic and research libraries, pharmaceutical and biotechnology companies, and private research facilities. The University of Georgia, Department of Biochemistry and Molecular Biology, Athens, U.S.A.